Stress fractures are an important concern for athletes and everyday folks alike, as they can really make an impact on the ability to not only perform, but to move around with ease. female athlete triad, a syndrome often marked by disordered eating, amenorrhea, and osteoporosis. Once you eliminate activity level and shoe type of the athlete, as above, what remains are primarily issues of biochemistry and biomechanics. From a biochemical perspective, much research has been done to validate the importance of calcium and vitamin D in the diet. Vitamin D and calcium are important for healthy bones, and good muscle function of the lower extremity (2). 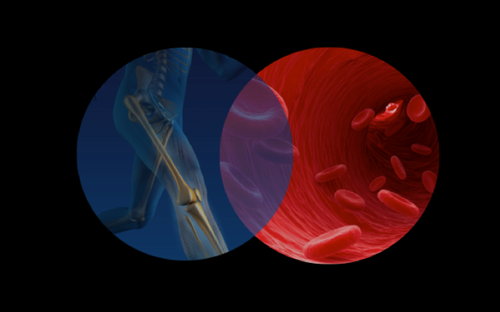 The relationship between calcium and vitamin D with bone health and stress fractures in athletes has been documented significantly in the literature as well (1-7). Many athletes are unaware of their calcium and Vitamin D levels until someone suggests testing after a stress fracture or injury. InsideTracker™ offers this testing as an entry-level screening tool for their most basic evaluation of blood biomarkers. Knowing Vitamin D levels in advance can allow for proper supplementation with Vitamin D3 products, which appear to work best (2, 7), and with follow up and regular tracking of the blood biomarkers to make sure that levels remain at their best. 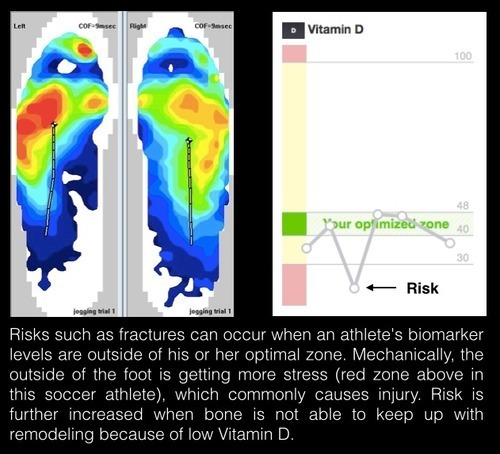 Additionally, InsideTracker™ provides nutritional supplement and dietary suggestions to maintain optimal levels of vitamin D.
So, how do biomechanical issues come into play regarding high impact and high activity levels with stress fractures in athletes? Is there a relationship between high pressures in the lower extremity and stress fractures in the foot and lower extremity? Are there structural and functional issues that can be identified or screened for and that can provide a reason for why these stress fractures occur? It is well known that the use of pressure mats and in-shoe pressure devices can identify high-pressure areas of the feet. Dr. Scholl’s utilizes pressure mat technology in their kiosks at Wal-Mart to sell over-the-counter orthotics. What might be some of the causes of high pressures in the feet in athletes? Several studies have looked at high-pressure areas in low- and high-arched feet of athletes (8-11). High-arched feet tend to elevate pressures along the lateral aspect of the foot, and lower arched feet tend to have higher pressures along the medial aspect of the foot, i.e. the second metatarsal area in the ball of the foot. What about a restriction in ankle joint range of motion? A study of diabetics with 0 degrees of ankle joint dorsiflexion range of motion found significantly higher pressures under the ball of the foot or the MPJ areas (12). Athletes tend to have dorsiflexion restriction in their ankle joint range of motion (13), so higher pressures in the ball of the foot should be of great concern to the medical staff caring for athletes. Bending forces at the metatarsals in relationship to pressures at the foot are related to stress fractures as well (14). Prolonged pressures in the ball of the foot in conjunction with an increase in overall time spent on the ball of the foot can and will lead to stress fractures. It would be great if we could guarantee that athletic shoes would protect athletes from injury, but a recently released study of professional soccer players showed that their shoes caused an increase in lateral mid-foot and fore-foot pressures and are likely linked to an increased incidence in 5th metatarsal stress fractures (15). Finally, it is important to screen athletes that are prone to bone injury due to high-impact activity and risk of poor nutritional status. Soccer players are at high risk because of their shoe gear and because many athletes just don’t eat well when they are young. Young females may have poor nutritional status as well and are active in high impact sports, too. While screening tools are not perfect and some percentage of this population may still fall through the cracks and sustain a bone injury, it is still best to be proactive; screen and intervene wherever possible. Nutritional screening, utilizing good foot and ankle screening analysis, and control of shoe gear are all essential to preventing injury. Bruce E. Williams, DPM is Director of Gait Analysis Studies, Weil Foot & Ankle Institute, Chicago. 1) Vitamin D, Calcium, and Dairy Intakes and Stress Fractures Among Female Adolescents. Kendrin R. Sonneville, ScD, RD; Catherine M. Gordon, MD, MSc; Mininder S. Kocher, MD, MPH; Laura M. Pierce, BA; Arun Ramappa, MD; Alison E. Field, ScD. Arch Pediatr Adolesc Med. 2012;166(7):595-600. 2) Should we be concerned about the vitamin D status of athletes? Willis KS, Peterson NJ, Larson-Meyer DE. Int J Sport Nutr Exerc Metab. 2008 Apr;18(2):204-24. 3) Vitamin D: what is an adequate vitamin D level and how much supplementation is necessary? Bischoff-Ferrari H. Best Pract Res Clin Rheumatol. 2009 Dec;23(6):789-95. 4) Evaluating the relationship of calcium and vitamin D in the prevention of stress fracture injuries in the young athlete: a review of the literature. Tenforde AS, Sayres LC, Sainani KL, Fredericson M. PM R. 2010 Oct;2(10):945-9. 5) Vitamin D deficiency: a common occurrence in both high-and low-energy fractures. Steele B, Serota A, Helfet DL, Peterson M, Lyman S, Lane JM. HSS J. 2008 Sep;4(2):143-8. Epub 2008 Jul 19. 6) Prevalence of vitamin d deficiency in patients with foot and ankle injuries. Smith JT1, Halim K, Palms DA, Okike K, Bluman EM, Chiodo CP. Foot Ankle Int. 2014 Jan;35(1):8-13. 7) Current concept review: vitamin D and stress fractures. McCabe MP, Smyth MP, Richardson DR. Foot Ankle Int. 2012 Jun;33(6):526-33. doi: 10.3113/FAI.2012.0526. 9) Foot morphology and foot/ankle injury in indoor football. Lauren E. Caina, Leslie L. Nicholson, Roger D. Adams, Joshua Burns. Journal of Science and Medicine in Sport (2007) 10, 311-319. 14) Soccer boots elevate plantar pressures in elite male soccer professionals. Carl HD, Pauser J, Swoboda B, Jendrissek A, Brem M. Soccer Boots Elevate Plantar Pressures in Elite Male Soccer Professionals. Clin J Sport Med. 2014 Jan;24(1):58-61.